Mummy Sleeping Bag: High Peak Mt. 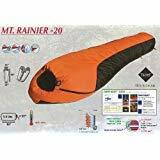 Rainier WATERPROOF ~ MINUS 20 Degree F. -20 Degree F.
This is one of the greatest sleeping bags on the market. The outer shell is Dupont Invista, which is the newest version of gortex. This is a waterproof membrane from the outside and breathable from the inside. 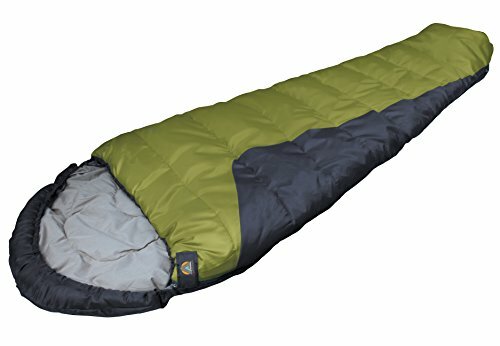 This is an extra long, very comfortable sleeping bag and weighs only 6.5 pounds. 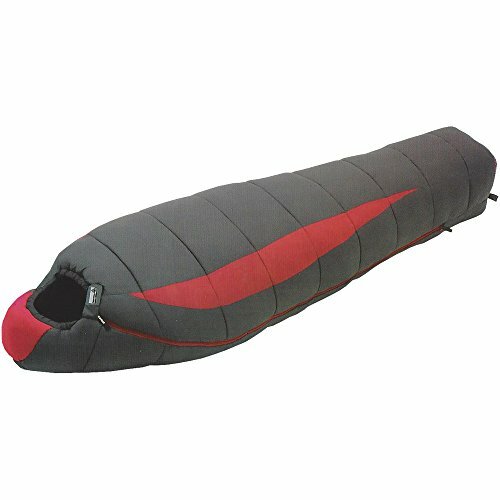 Please search the internet for all of the positive feedback on this unique sleeping bag. The TR 0 is a 3.3-Pound 0-degree Mummy sleeping bag. 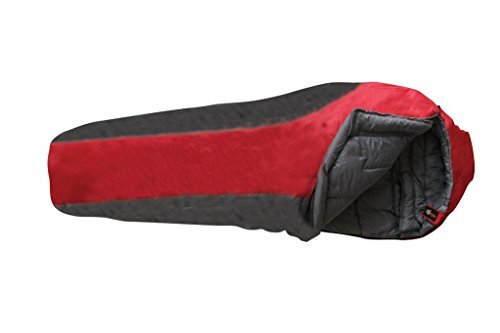 This sleeping bag is made of all polyester materials with bi-directional zippers that can also be zipped to another bag to make a TR 0 double bag. At 90.5-Inches in length the TR 0 will cover even the Tall person in your camping group. The summit 0 degree XL is an extra long (95 inch ) comfortable Mummy bag. It's rated to withstand temperatures down to 0 degree Fahrenheit. The Dura fiber H1 insulation makes this bag warm and very cost-effective for families. The sewn in draft tube and chest collar will keep the chill out, along with the hood and its drawstring closure and barrel lock. Two bags can be zipped together. The shell is made of 100% ripstop polyester taffeta and the liner is made of polyester taffeta for ultimate comfort. 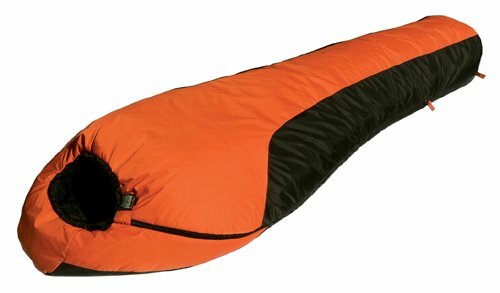 The Cascade -40 sub zero Mummy bag is an affordable cold weather, 4-season sleeping bag. The overall size is 34 wide x 86 long x 22 wide at the foot. A compression stuff sack is included free! zipper: #8 two-way. Two bags can be zipped together side by side. Made for variable mountain climates, the Sonic is the only bag you'll ever need for mountaineering. The premium suite of fabrics and 850 fill power down is complemented by adjustable Thermo Gills, which regulate temperature without letting cold drafts in. Stretch construction at the knees offers extra room for side sleeping or to change positions during the night, as well maintaining the bag's shape, thermal efficiency, and loft. An oversized draft collar with a Velcro closure seals in heat and keeps cold air out, and the waterproof/breathable footbox keeps your feet toasty and warm. Includes a compression stuff sack and cotton storage bag. 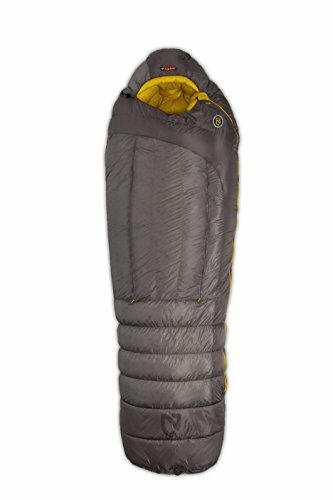 Mummy Sleeping Bag: High Peak Mt. 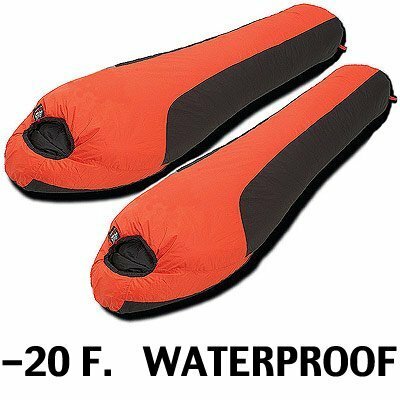 Rainier WATERPROOF ~ ZERO Degree F. 0-Degree F.
Frontier by Moose Country Gear ~ Windproof, Waterproof and Breathable ~ The Frontier﻿ series of sleeping bags is unlike anything else on the market today. These bags are absolutely waterproof with taped seams - yet your body moisture is able to exit the sleeping bag. We have two sizes available; an Extra Large, Extra Long and this Mid-Size. These bags are 32 inches across the shoulders, 78 inches long and have a 22 inch box foot. The shell is made with a ripstop nylon taffeta identified as Amphibeia 3000, which guarantees to keep you warm and comfortable. This Alpinizmo Latitude 0 Sleeping bag from High Peak USA features a lite weight breathable lining that radiates body heat to help regulate temperature. Rated for 0F, this sleeping bag is ready for your next outdoor adventure. This bag is great for backpacking which only weight 3 lbs. Latitude series bags have benn selected by Gear Institute for Best Value and Best in it's Class for 2013. Shopping Results for "High Peak Mummy Sleeping Bag"